Reply to "Continuing Saga … Appliance Store and Engine House beginning discussion"
Thanks gents! Yessir, that roof does add a lot of interest and is unusual. I tried Plan B today and then Plan C. Plan C worked! Exercised today for the first time since the Afib started on Thanksgiving. Took it easy, just did the recumbent bike and had no problems other that what I normally experience after not exercising for two months. Plan B was to make a lamination of three layers of 0.010" styrene sheet. I tried to mold it around this nice brass round bar, and it did accept some curvature with the three layers held together with Testor's tube cement. But the curvature was insufficient and it was still distorting. So I reverted back to using balsa sheeting soaked in Vinegar which is the same technique I used in shaping the Mansard roof sheets in the Nighthawks Project, only this time the curvature was tighter. My difficulty with this was the crappy balsa I was using. This was left over from a 20 year-old B-17 Royal/Marutaka RC bomber kit that I built on commission. I used this terrible wood on the fuselage with great tribulations, but bought new balsa for the wing skins. The stuff in my scrap box was the bad stuff. If the weather was nicer and if I didn't start exercising today, I would have gone to Scale Reproductions, Inc. and bought some new thin sheeting (I still have to do that), so I struggle with this sub-par wood. But even so, I was able to soak it, shape it and glue it to the formers with medium and thin CA. The tension on the bend broke some of the joints loose more than one, but I prevailed gluing everything solid including my fingers occasionally. But it worked! The balsa was trimmed near the top, bottom and corners, and then I soaked the end-grain with thin CA so I could use a sanding drum in the Dremel to shape the corners closer. I used the sandpaper on the surface place to sand the narrow side flush with the support structure, and then used the Precision Sander to sand the side edge to conform the plywood. I put each side on in turn sanding each as I went. To further sand the curves nicely with a piece of my self-adhesive medium grit sand paper onto the same piece of round brass. This worked perfectly. After all the sanding, the lousy wood had a lot of imperfections, so I slathered Squadron and Tamiya fillers on and will finish sand them tomorrow. Then I put the base together to conform to both the Mansard extension and the shape of the narrow bottom of the top knot. As I said, many, many times… It's not that I'm patient, it's that I am persistent… very persistent. My dad would always say, "Illegitimus non carborundum". Translation: Don't let the *******s grind you down! I knew I could figure out something that would shape this roof in a respectable manner. Scratch-building… no instructions. Just went back on Google Earth to get some more looks at the actual building. 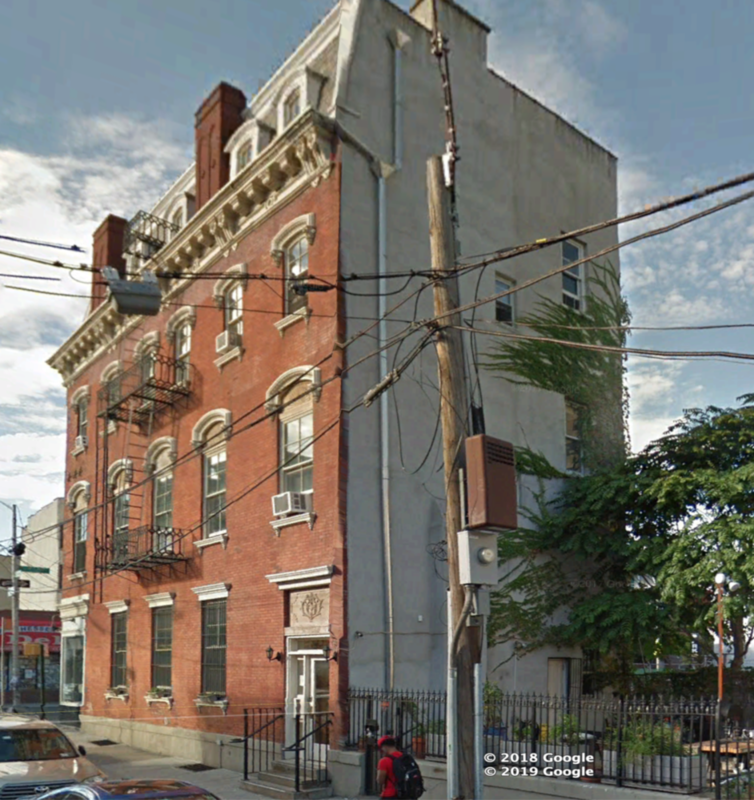 I went down E.151st street on Google Street View and got a different view of the rear of the building showing the downspout which is just about how I envisioned it, and A BACK DOOR. I need a back door and wasn't sure where it would go. Now I know. There's a nice garden out back. The large brick wall is almost entirely ivy next to the parking lot. Anyone have a way to make convincing ivy? I went on Gimp and removed some of the exaggerated perspective of the building. Just noticed that the upper corner turns back on itself in the corner. I may be able to do this (or not…depending on how much overhang is left at the corner). The downspout collects water from a scupper at the top roof level through a hole in the parapet wall. The other stem comes from the rain gutter at the cornice. Glad I built that gutter into it. It also looks like the collectors are brass so I'll be able to use untreated brass for that function. I'll could use aluminum tubing for the downspouts since these are pretty shiny. If I'm not mistaken, the parapet wall top looks like it has ceramic caps on them. That top roof cornice is very evident in this image. And what's that protrusion sticking up from the rear wall? I didn't notice that before. It looks like the top of the stair and a roof doorway. Hhmmmm? Can I do that at this late hour? I have Tichy fire escapes that I may add to the building… or not.